Plum Curculio (PC): PC activity continues, however in southern counties, treatments applied this week should provide control until egg laying activity ceases in early June as long as severe rain storms do not wash off insecticide. Fresh egg scars are still present in northern counties, so insecticide coverage is still required in northern areas. San Jose Scale (SJS): Scale crawlers usually emerge about the first week of June. If you have scale infestations on your trees, it is important to note if crawlers are present, even if you treated with oil in the early spring. If crawlers are present then treatment options include Esteem, Movento, Centaur, and Diazinon. Esteem, Centaur and Movento should be applied at the beginning of crawler emergence. Diazinon is labeled for only one post bloom or foliar application on stone fruit (Rec = max. of 2 lb/acre of the 50W). The apple label allows up to 2 foliar applications per year as long as a prebloom application WAS NOT made. Foliar applications may cause russet, but has worked in the field for scale crawlers as long as applications are made 1-2 weeks after the start of crawler emergence and again 2 weeks later. Thrips: Thrips tend to start building up at this time of year in weedy groundcovers and in hedgerows with flowering shrubs. This is shaping up to be a good year for thrips, as hot and dry conditions appear to be prevalent. Thrips were found during bloom in stone fruit and were observed in ripening cherries this week. A good way to monitor for thrips activity is to collect blossoms from flowering plants near the orchard and shake them onto a sheet of white paper. If present the adults will fall out of the blossoms and can be seen moving quickly on the paper sheet. Thrips control will be most important as fruit begins to color. Anthracnose: Hot and wet weather is favorable for anthracnose infections. The varieties Klondike, Harrow Beauty, Snow Giant, and Sugar Giant seem to be particularly susceptible. Growers may find it useful to protect against anthracnose, especially in blocks that have a history of the disease. For all practical purposes this means avoiding the use of sulfur in those blocks, and substituting Captan (2.5# 80W; 4# 50W) for the next several weeks. Ziram @4.5-8#/ac is also effective. Pristine should also be effective. Codling Moth (CM): The following chart updates application timings for southern and northern counties. Overall, trap counts are low, but a few sites still show populations above treatment levels, even though 2 timed treatments may have already been applied. Fire Blight: The shoot blight phase of the disease is present in some locations in only a few locations in southern counties at low levels. Most levels are very low in northern counties. However where orchards were not treated, severe fire blight cases have been noted. Considering the high potential for infection predicted by the model at NEWA this is good news. Where blight is present pruning out infected shoots is important now especially if thunderstorms are predicted. Summer Diseases: In addition to continuing management for the end of primary scab season, Rots and Sooty Blotch and Fly Speck should be taken into consideration. Anthracnose (Bitter Rot) has been troublesome over the past few wet seasons especially on Empire. If you are using the extended EBDC schedule control should be good on most cultivars. Where anthracnose control has been difficult to control consider using Pristine, or adding Captan or Ziram to the program. Pear Psylla: Egg laying is increasing. Emergence of nymphs will increase over the next week. If you have pears and psylla are present, then target treatments for the young nymphs (softshells), if you have not done so already. See last week’s newsletter for suggested materials. Plum Curculio (PC): The number of sites with PC adults has increased to 20% over the past week. However, the maximum count per site remains the same as the previous week at 5 PC adults per 10 bush sample. In addition, we are seeing damage on the fruit from PC at 45.7% of the sampled sites. 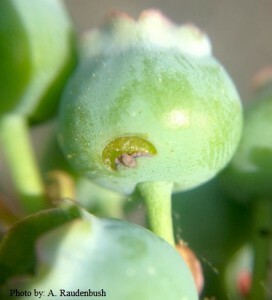 The highest level of injury seen in a field was 3.1% of fruit clusters damaged. Damage is monitored for by observing approximately 1000 fruit for a crescent shaped scarring (Figure 1). Treatment options after bees are removed include: Avaunt, Imidan, Danitol, Brigade, Mustang Max (pyrethroids weaker on PC). Leps. and other larva: Leaf roller larvae and other leps are present in 17.6% of the fields. The maximum number of lep larvae over the past week has increased to 4 per beating tray sample. Over the past week there has been some damage to fruit, the highest level of injury seen was 4% of fruit sampled. In addition to leaf rollers, green fruitworm species and eastern tent caterpillars are also being found. Aphids: Aphids were first found on May 6th and we continue to find aphids in Burlington and Atlantic counties. Over the past week 58.3% of sites scouted had aphids present. An average of 2.6 aphids are being found per 50 shoot sample. So while aphids are getting more widespread, there actual numbers are low. Since aphids are capable of vectoring Blueberry Scorch Virus, there is a low threshold for aphids in the field. Treatment options for aphids include: Assail, Actara, Admire Pro and Sivanto. Sivanto Is Not a Neonicotinoid, and is a bee safe product. Its mode of action is similar to that of the neonicotinoids, and therefore is very effective for sucking insects. In blueberries it is labeled for aphids and thrips. At the higher rate, Assail will control cranberry fruitworm. Actara also controls PC but not Leps like cranberry fruitworm. Cranberry Fruitworm (CBFW): Trap counts for CBFW remained low over the past week. In the past week 3 traps each had 1 CBFW present. Typically the spike in CBFW is around the end of May or beginning of June. We are continuing to monitor traps for adults.